The band’s 1993 release became the fastest record they’ve ever made. Even while they were on the road all over the world on the ZOO TV tour, the ideas for U2’s next album were burning such a hole in their pocket that it became the fastest record they’ve ever made. Just as Bono had explained that Rattle and Hum belonged with The Joshua Tree as its natural partner, the band knew in their bones that 1991’s Achtung Baby would soon inspire a complementary follow-up. Its name would be Zooropa, and although it was first envisaged as an EP, it simply demanded to become their eighth studio album. As ever, there was some extracurricular fun en route, such as the night in January 1992 when The Edge inducted the Yardbirds into the Rock and Roll Hall of Fame. During the ‘ZOO TV’ tour, on-stage guests included Axl Rose in Vienna, Steven Tyler and Joe Perry in Paris and Benny Andersson and Bjorn Ulvaeus in Stockholm, for an unexpected U2 take on ‘Dancing Queen.’ In August, they became only the second act ever, after Billy Joel, to perform at Yankee Stadium in New York. 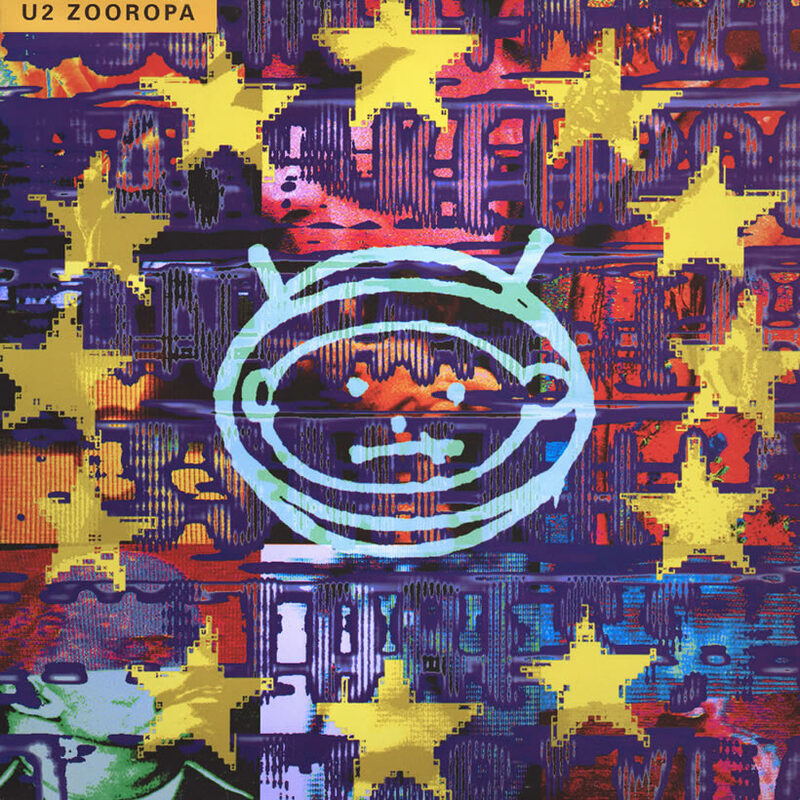 U2 started making Zooropa early in 1993, during a break in that ‘ZOO TV’ itinerary, with the audio-visual extravaganza evolving into the ‘Zooropa’ tour once the record was completed. This time, three Dublin studio locations were involved: Westland, The Factory and the band’s trusted recording spot which retained its old name despite a new relocation, Windmill Lane. In another first, these last two studios ran in production with the record simultaneously. The album arrived in record stores on 7 July, only 20 months after Achtung Baby and with 100-plus epic concerts in between. The Edge explained such a marathon of momentum by telling Q magazine, on the road in Italy: “I think we were still surfing on the wave of creative energy from Achtung Baby and the ZOO TV tour when we were making Zooropa. It was the same burst of inspiration. For the first time, The Edge was named individually as co-producer of a U2 album, along with their unswerving confidant Brian Eno and another new name in the credits, but one who was in reality a U2 veteran. Mark ‘Flood’ Ellis had co-engineered The Joshua Tree and then, after enhancing his reputation immensely by co-producing Nine Inch Nails’ Pretty Hate Machine and Depeche Mode’s Violator, returned to the U2 fold for Achtung Baby. With Daniel Lanois unavailable for Zooropa, Flood was the perfect choice to step up as co-producer, in what has been an enduring relationship. The opening shot for Zooropa, and the defiant choice as its lead track in June, was the mantra-like, sound effects and sample-drenched ‘Numb.’ It was uncompromising and cutting edge, on the cusp of an almost industrial dance timbre that set the scene for the futuristic course plotted by the full album. Zooropa offered such a rich palette of sounds to take in, such a wash of instrumental colours and effects to assimilate, that it was wise and appropriate for Bono often to assume a measured, less-is-more vocal delivery. Indeed, on ‘Numb,’ again on the club-friendly ‘Lemon’ and at times on the tender ‘The First Time,’ he showed an entirely new facet by using a falsetto delivery. Another single, ‘Stay (Faraway, So Close! ),’ was used in an alternative version in the Wim Wenders film of its subtitle. That led to a Golden Globe nomination for Best Original Song; the track also went to No. 1 at home in Ireland and into the UK top five. Elsewhere on the album, Bono’s lyrics explored areas that he admitted at the time he was only beginning to understand himself. The album concluded with one of the most notable collaborations in U2’s history, when a 60-year-old Johnny Cash provided the lead vocal on the closing track, ‘The Wanderer.’ Just as with B.B. King some years earlier, the band’s fascination with the true heartlands of American music helped them to a remarkable achievement with another hero. The Zooropa tour roared into life, even with the album still in production, at the Feyenoord Stadium in Rotterdam in May. This sensational, stadium-sized rock spectacle raced through Europe all summer long, coming to rest in Dublin in late August before rebooting as Zoomerang in New Zooland, as they affectionately termed it, in November. By then, Zooropa was on its way to worldwide sales of some seven million, after topping the charts in the UK, the US, Australia and all over Europe. It was yet more validation of what, even by then, was a unique relationship between four friends. Follow the official U2 Best Of playlist.